In our yard in Sudbury we stock ductile iron pipe, mechanical joint and flanged fittings, as well as these other joining and restraining products. Call us today for made to order fabricated flanged pipe, available any length, spools or plain end, in 3″ – 54″ shop coated ductile iron. 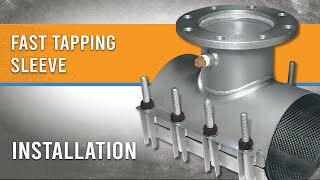 Ford’s Adapter Flanges allow a flanged connection to any plain-end piece of pipe with minimal headache. 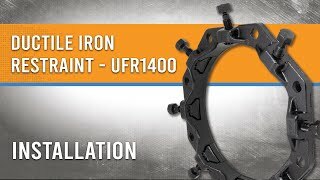 The UFAs are available and sized for ductile iron, steel, or PVC with different pressure ratings available. The FCA flanges are sized by outside diameter and can be sized to join different nominal pipe sizes. Make up space and change pipe sizes at the same time. All compact flange reducers come complete with accessories for both sides. Ford Dismantling Joints are flanged joint fittings available in sizes 4” through 30” and they provide longitudinal adjustment in a flanged piping system when exact pipe measurements are slightly off. This allows for flexibility during design and installation as well as easy accessibility for maintenance. Repairing a leak at the bell joint of PVC or iron pipe can be quite costly and time consuming. With a simple repair, bell joint leak clamps can save an otherwise serviceable run of pipe from needing replacement, as many leaks begin at pipe joints. Mechanical joint restraining glands are available for ductile iron and PVC pipe and are the fastest, cheapest way to secure MJ connections without costly and cumbersome thrust blocks. Foster Adaptors take a lot of the extra work out of connecting mechanical joints. The bolt-through design makes the job fast and easy with far fewer bolts to tighten. Foster Adaptors come complete with all accessories. Ford’s FAST tapping sleeve makes large pipe taps much easier. A gridded gaskets surrounds and protects the pipe, helping to prevent breaks during the tap. The welded 304 stainless steel outlet is available flanged or with an MJ outlet for an even better alignment. FAST tapping sleeves are available with 3″ – 12″ taps on up to 24″ outside diameter mains. Ford’s FAST tapping sleeve features 304 stainless steel bolts that are attached to the body of the sleeve at a lifter bar so they’re less likely to be lost in the ditch. However, sometimes removable bolts and nuts are advantageous for narrow spaces or a more flexible fit – this is where the FTSS comes in. A gridded gaskets surrounds and protects the pipe, helping to prevent breaks during the tap. The welded 304 stainless steel outlet is available flanged or with an MJ outlet for an even better alignment. FTSS saddles are available with 4″ – 24″ taps for 4″ – 24″ pipe.